If your Spherical on the Prescription is below -6 and your cylinder is below -2, we can make your Prescription Polarized Floating Sunglasses with this frame style. Our prescription sunglasses are also providing UV400 protection. The available Frame Colors in our warehouse are Black, White, transparent deep Blue, Orange, Yellow, Green and Iron gray. The available lensâ€™ colors are Grey, mirrored treatment Red and Blue color. Please kind to send us the information of your Prescription and what the frameâ€™s color, the lensâ€™ color you need is as the attaching photo by email after you order this item. We will finish your prescription sunglasses in 10 days. We offer 180 days guarantee for the quality of our sunglasses. During the warranty period, if the product fail under normal use due to improper workmanship or faulty materials. We will, without charge, repair the product or replace it with a comparable one or to back part or all the payment to our customers. But, it is very easy having some tiny or deep lines on the surface of the lens, if the owner does not take care of their sunglasses well. So, we do not provide the warranty for the Scratch on the lens. Our sunglasses meet the safety requirements of ANSI (American National Standards Institute ), ASTM international (American Society for Testing and Materials ) and CE for Testing and Materials and Marking. Regarding the testing report of our sunglasses, please see the attaching photo. 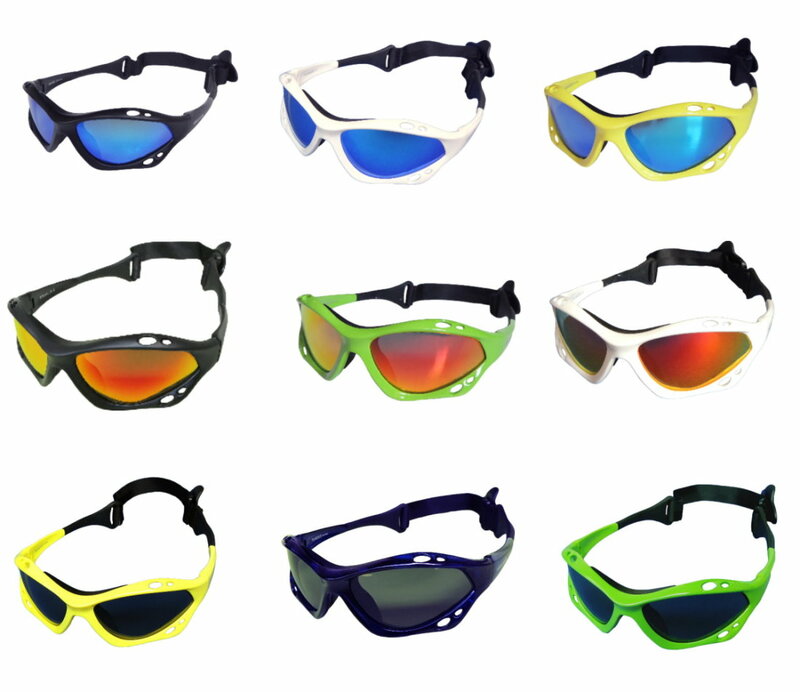 Our sunglasses is special designed for Extreme Sports and water sports, such as kitesurfing, kiteboarding, Windsurfing, Surfing, kayaking, wakeboarding, Jet skiing, Snowboarding and fishing SUP. Each pair of our sunglasses comes with one micro-fiber pouch, one safety leash and one zip box. We use impact resistant Polycarbonate lens. UV400 Rated lensï¼š Our lenses provide UV400 protection from harmful rays. Polarized lensï¼š We use the polarized lenses in our sunglasses to provide you the perfect vision when you are taking a water sport or driving. The full wrap around frameï¼š It provides complete coverage for your eyes to keep out the sunlight and spray during extreme conditions. The frames are ventilated for optimum clarity. TR90 Frame:TR-90 is a superior compound which has no risk of toxicity or allergy. It is extremely light weight and designed to flex making it resistant to stress cracking and material fatigue. The nose are padded with soft material: It is not only protecting the wearâ€™s face when his sunglasses be impacted, but also gives extra comfort for long time wear. Our sunglasses incorporates an adjustable non-removable strap: that is comfortable, secure and easily adjustable with one hand. Our sunglasses can FLOAT on the water, if you drop them in the water. Safety leash: We provide a line for you to use it to connect with your neck or the life jacket to avoid to lose your sunglasses when you are taking water sports. The line will broke when the power to pull the line is over 10 kg to make sure the line is safety. Each pair of our sunglasses will be shipped with a micro-fiber Pouch and a zip box. Let you easy to clean the lens, to store and to protect the sunglasses. We can ship our products to any place on the earth.